Getting a hold of what to do: First things first, one needs to decide what kind of garden they want to make. Some might want to set up a vegetable garden; some might have a longing towards mint, thyme and end up wanting a herb garden. Someone else might love to look out at a bed of colorful flowers. It depends on what the person wants. After deciding one should just start working on it. Choosing a site: While choosing what kind of garden one wants, they should make sure that there is provision for the plant to get more than six hours of sunlight. Plants need to be placed in well light spaces and also need to have adequate shade. Different plants need different amounts of sunlight. Clearing the bottom space: Sodder needs to be cleared out if one wants their plants to grow faster and healthier. Sodder can be cleared all at once or just by digging from time to time. Improving the quality of the soil: Soil is what the plant strives on. If the soil is not up to mark the plants will suffer a lot. Manure needs to be added to the soil from time to time to keep it healthy. Manure adds more nutrients to the soil thereby making the plant healthy. Soil tests can also be done to keep an eye on the soil. Digging: A lot of people do this while some do not. This is basically the fact that digging can help the roots of plants to loosen up and thereby the roots can go in deeper. This makes the plant healthier. Hanging planters will not need much digging. Picking the right plants: One may wish to grow exotic plants in their gardens but what they forget is that plants have different necessities and some are really hard to take care of. If one is a beginner they should start with easier plants like cucumbers, tomatoes, pansies, sunflowers, coriander, among others. Watering the plants: This is no new news that plants need water to survive. Without water, it is really hard for them. Water needs to be supplied adequately and from time to time. Roots might dry up the cause of less water while over watering might lead to waterlogging thereby harming the plant again. Following these simple steps can help one get a nice garden. Regular watering, getting rid of the weeds and applying enough manure are all the small things that one needs to consider. 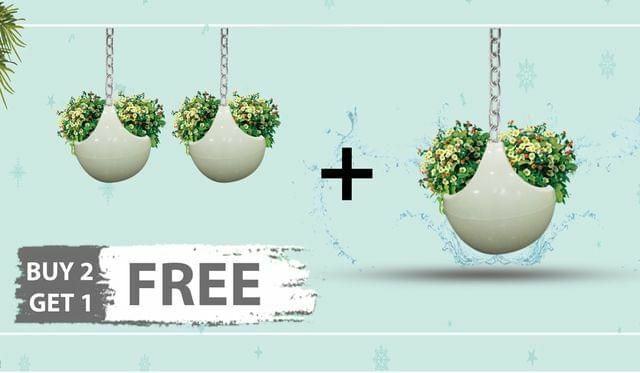 Hanging planters can also be added to increase the aesthetic of the garden. If you are a fan of reducing, reuse and recycle, be sure that you are using the foliage of your garden as a natural fertilizer. Foliage is one of the best ways one can do their part when it comes to returning nutrients back to the soil.